Back awhile ago, I mentioned about eating at Zheng Yi Hainanese Beef Noodles at Tai Thong Crescent. 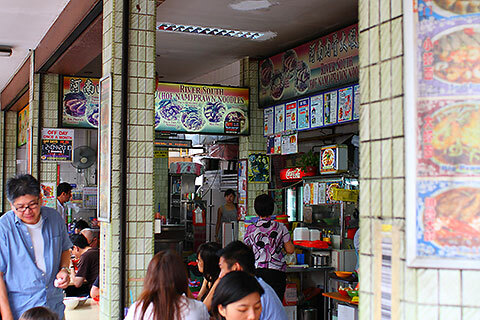 But actually further inside the road, there is another famous stall, this time selling prawn noodles – River South Prawn Noodles. 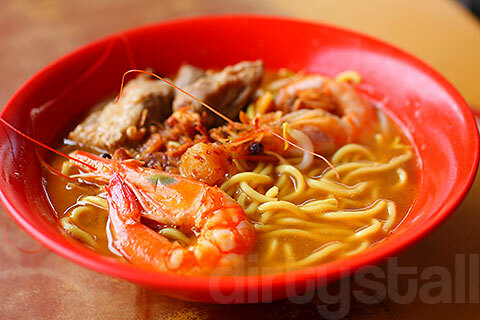 It’s quite packed most of the time, and for good reason – their prawn noodles are delicious! This is their home-made fishcake, seemed quite popular because many tables had ordered it so I tried it as well. 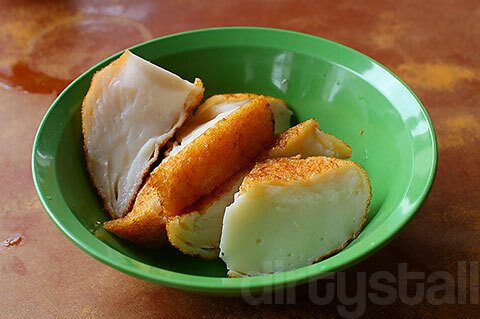 I would say it was denser and had more flavour than the regular fishcake. I ordered the prawn noodles with pork ribs here. I think the main thing that makes the soup so tasty is how intense the umami prawn flavour is concentrated in the soup. The prawns are also quite fresh and the pork ribs are easy to pick off the bone. A more expensive bowl of prawn noodles! 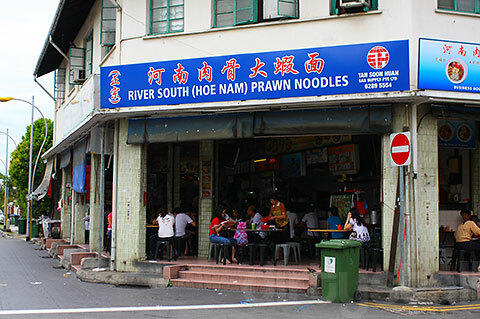 12 Responses to "River South (Hoe Nam) Prawn Noodles"
Yeah it’s a slice of old Singapore, slowly disappearing. I actually prefer River South (Hoe Nam) to Wah Kee. Wah Kee’s soup is very one dimensional, the spiciness kills all the umami there is. 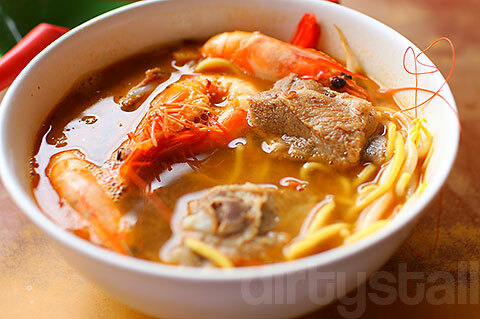 River South’s pork based prawn stock gives it more flavor depth. And chili powder is indispensable. Hmm I don’t add any chilli anyway so it doesn’t make a difference to me on that point haha. I’d say overall the River South soup is better but if I was feeling rich, I’d buy Wah Kee’s $10 soup because that one is really shiok! oh wow, I was there last year…and oh the noodle was so good, it was really busy when I got there, but it was worth the wait. Singapore was one of the places I had wanted to visit for a long time, and I really want to go back again. The food is just so good, too bad the heat was too much for me. Not a tropical girl at all, but I definitely will go back and stay another week. I’m ditching Wah Kee for this! Have been a regular at Wah Kee until the grumpy lady owner became unbearably rude!! What’s wrong with her? Haha I think River South has a more balanced taste but it can be hard to park a car there.